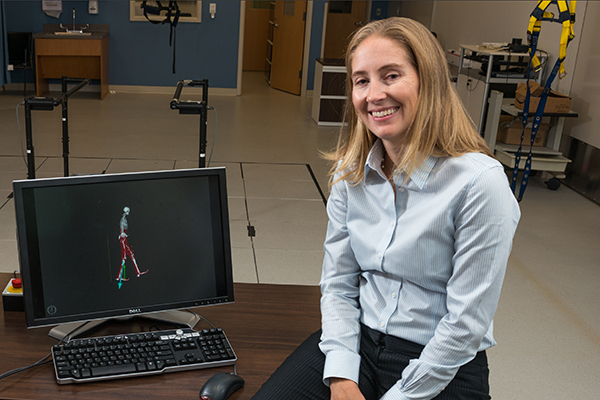 Jill Higginson has received a five-year grant from the National Institutes of Health. 11:05 a.m., May 27, 2015--Jill Higginson has received a five-year grant from the National Institutes of Health that will build a link between two successful biomedical engineering programs at the University of Delaware: clinical immersion and senior design. “Rapid growth in the biomedical field has created a crucial need to provide appropriate training for the emerging workforce that will be responsible for translating new devices and technologies from the bench to the bedside,” says Higginson, associate professor in mechanical engineering and biomedical engineering. Through the clinical immersion program, which was launched in 2013, students get a first-hand look at real-life biomedical engineering challenges by shadowing health care professionals and observing clinical practices. The interdisciplinary six-credit senior design capstone course is structured to simulate an industrial design team experience. Each team selects a project, determines the customer’s wants, benchmarks best practices for the desired function, generates design concepts and selects the best concept. Then, they build a prototype, test it, and improve their designs. Now, the NIH grant will bring the two education experiences together by expanding the senior design program to include clinically motivated projects identified during previous clinical immersion experiences. Within the context of design projects, students will identify the significance of unmet clinical needs and the impact of finding practical solutions, outline the design constraints, and generate working prototypes to address the problems.